There’s nothing like the delicious aroma of roasting meat! 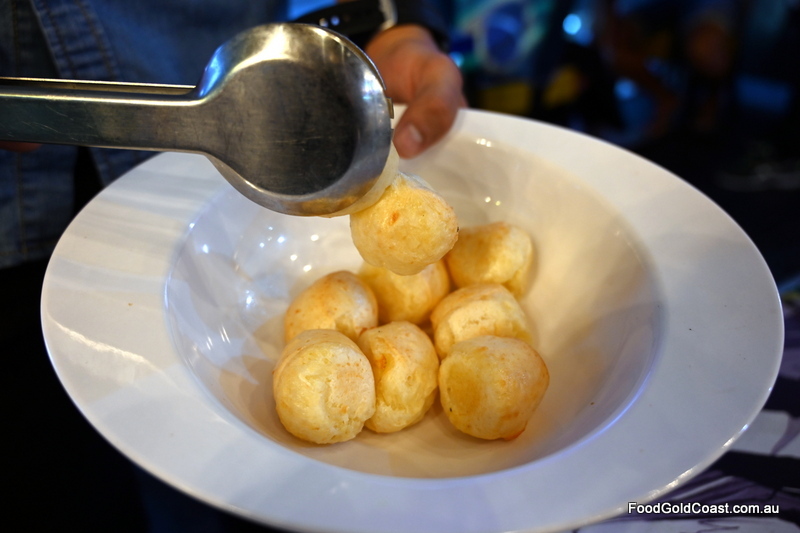 Brazilian Flame is a tribute to all things Brazilian (well, almost)! 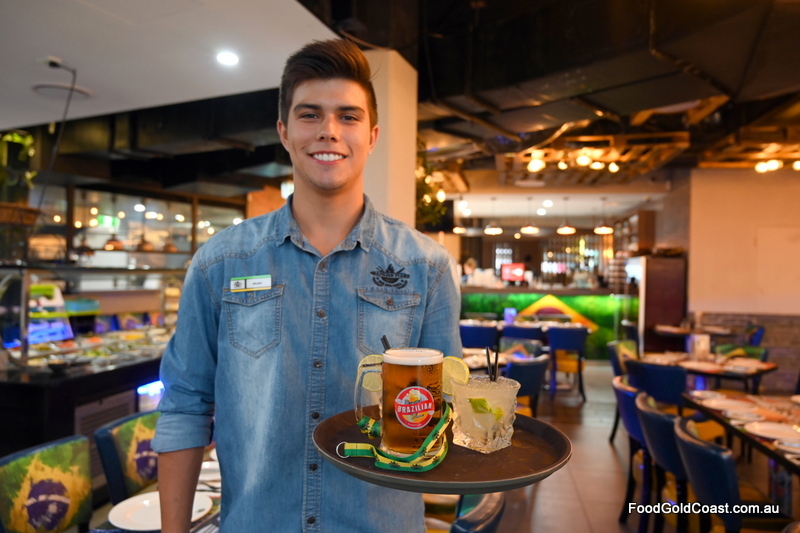 Sporting the country’s flag in its brightly coloured tables and chairs, honouring its most famous footballer, Pele, (who the restaurant’s owner Richard had the pleasure of meeting), the ‘all-you-can-eat’ churrascaria experience Brazilian Flame is a feast for the senses. 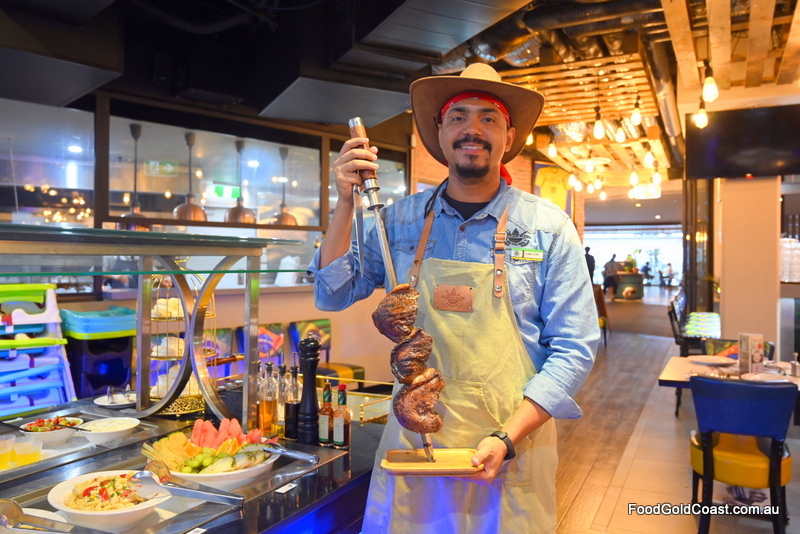 Opened late in 2018, Brazilian Flame is our only churrascaria, an experience closely tied to the history of Brazil’s gauchos, the cattle drovers or cowboys of the southern parts of Brazil. After droving all day, tired and hungry, they set up camp around a fire, burned wood until coals were formed and prepared the available food for dinner: meat. For centuries, gauchos barbecued their meat the same way: large chunks of meat threaded onto skewers to cook over coals. When the meat was cooked over the charcoal, the skewer was passed around for everyone to carve off as much meat as they wished. 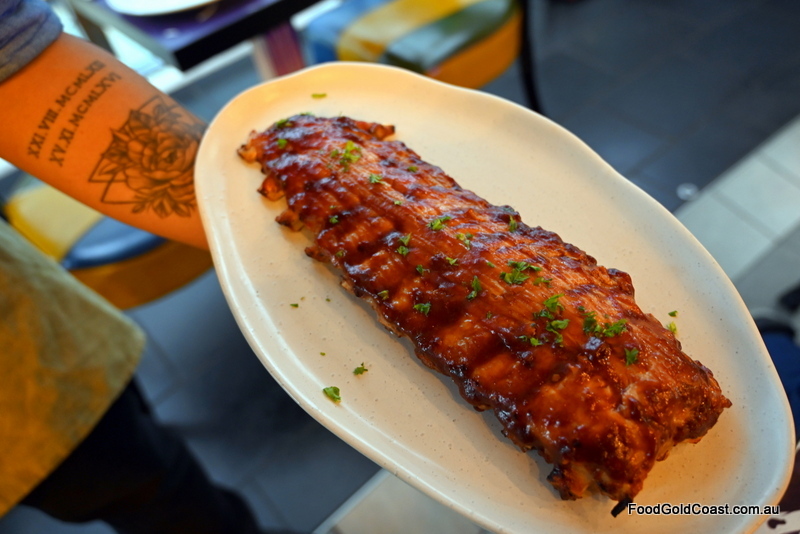 After their return home, they missed the flavours of barbecued meat, and churrascarias were born as restaurants following the same style of cooking. 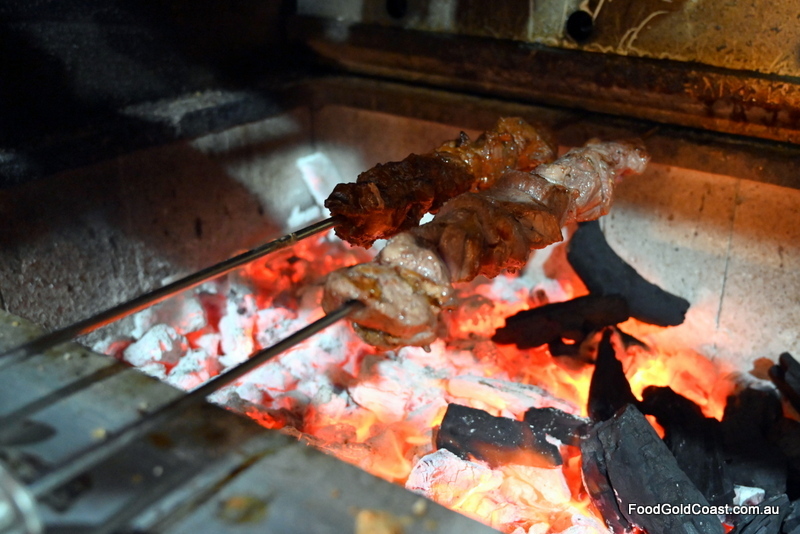 Today, the unique ‘Rodizio’ style of service provided by churrascarias such as Brazilian Flame means that waiters carry the meat on skewers straight from the charcoal grill to your table, introducing each one of the twelve cuts of meat and carving off the desired number of pieces of meat at your table, the diner taking the carved meat with small tongs. 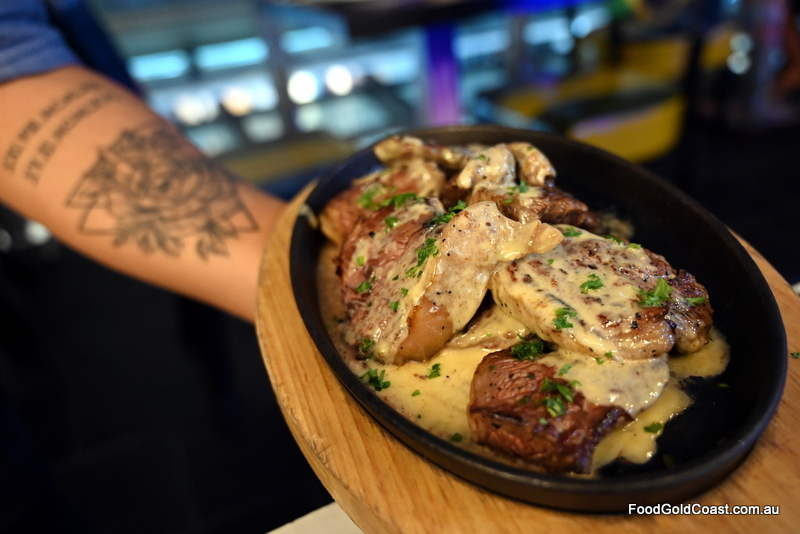 “Brazilian Flame is all about the highest level of product and service,” owner Richard Curtin tells us, as we tuck into some tender, succulent meat. 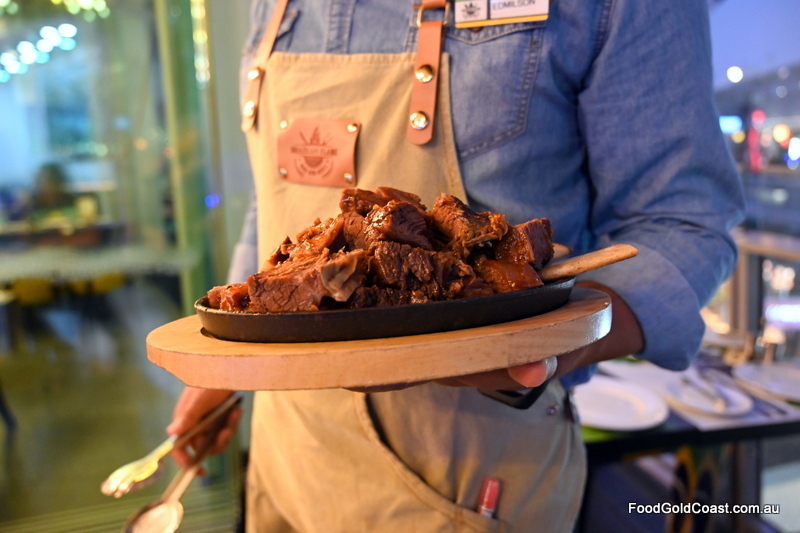 Prepared ‘with salt and love’, the skewers include delicious garlic bread, BBQ corn, kangaroo, chicken, pork, lamb, beef and crocodile in twelve cuts including pork neck, belly and ribs, and beef ribs, hump (so tender that it falls apart at the touch of a fork), tri-tip and picanha (rump cap). 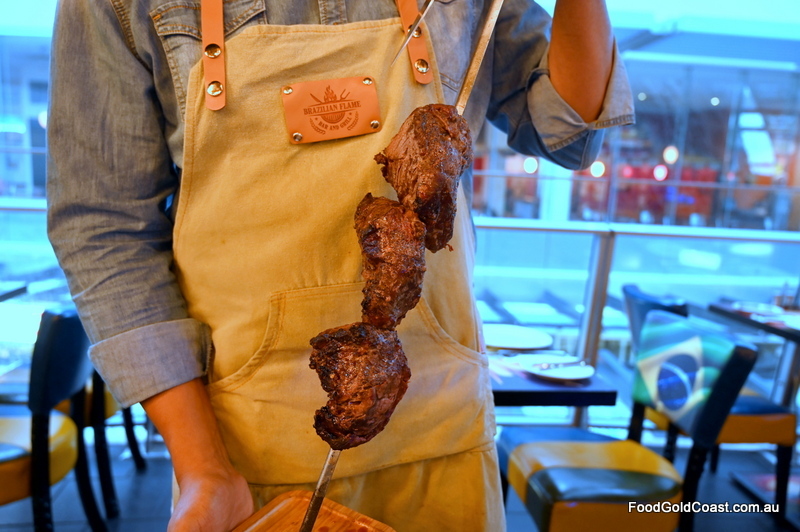 It’s a ‘Brazil meets Australia’ menu, the meat all export quality, prepared on two separate grills, one being halal. 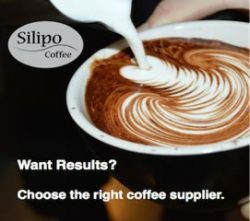 By ringing ahead, the kitchen can cater for other dining preferences or dietary needs. 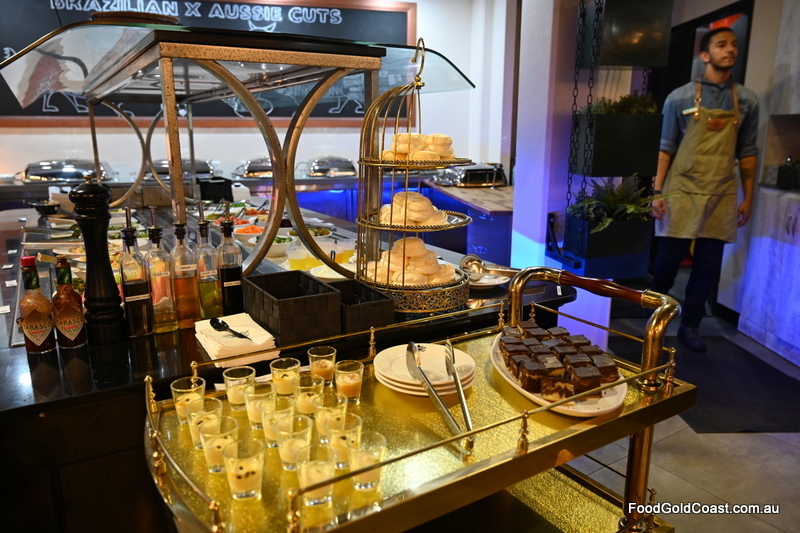 As well as the skewers, the meal price includes a buffet of hot dishes (such as beef stroganoff, spaghetti bolognaise, rice, beans), a salad bar and dessert bar. The bar, slung around one corner of the venue, will cater to your needs with Brazilian beer, cocktails and wine at an extra cost. 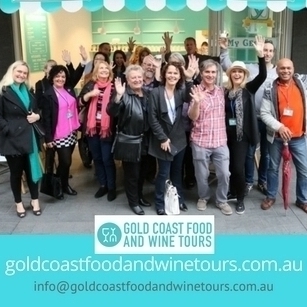 Brazilian Flame is a fabulous addition to the Surfers Paradise food scene, a dining experience that caters well for tourists, families, groups and couples. Carrying the colour and flair of Brazil with well-mannered young international staff, Brazilian Flame provides a great night out. 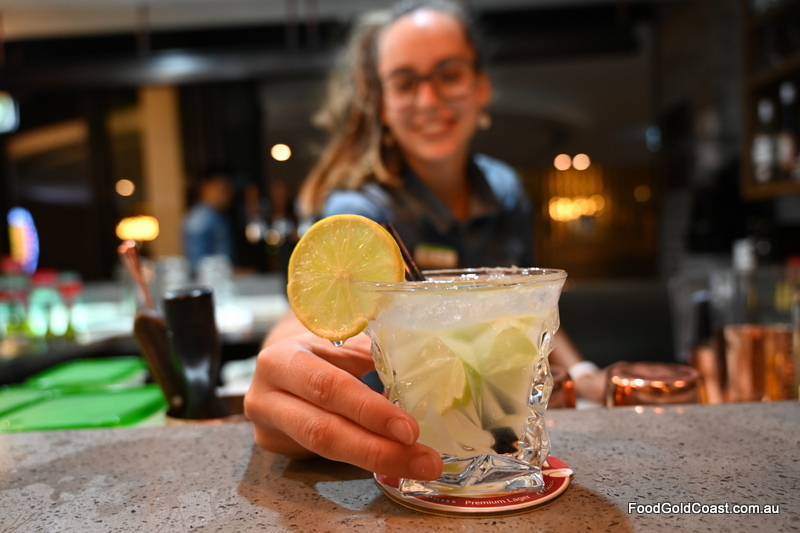 With caipirinhas $11.95 from Monday to Thursday, it would be too easy to while away a few hours being served delicious flame-grilled meat washed down by caipirinhas. All you need are a few gauchos to sit beside you.